Quality rack for growing out or displaying Zoa frags, would also work well with encrusting sps or other matting soft corals. 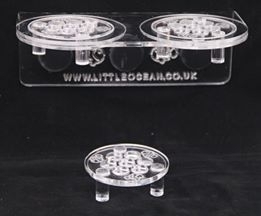 Close plug arrangement allows the coral to grow to neighbouring plugs allowing you to cut out the new frag and replace with a clear frag plug. Couldn't be simpler! flat surface holding frag plugs flush to the disc. Comes with three discs so one spare for moving frags, can also be used free standing. Holds securely on up to 12mm glass.